I read a mainstream report about a decline in gold imports into Hong Kong, with the journalist concluding that gold demand in China is therefore down. The interesting thing about the article is that the figures stated were accurate; Hong Kong imports into China are down. But here’s the thing: the message is wrong. It’s incomplete, misleading, and as I show below, misses the forest for the trees on what’s really happening with gold inside China. If an investor makes a decision because of that article, they may not be basing it on false raw information, but on an entirely faulty conclusion. The fact is, overall gold demand in China is rising. More importantly, there are fundamental developments underway in the country that will almost certainly have far-reaching effects on the gold market. And many of these developments – if not all – will serve as major catalysts for the gold price. And since they’re rarely reported by the mainstream the investment community at large will be caught off guard when they transpire. I’ve met Chinese dignitaries and government officials in China. I’ve spent time with some Chinese miners, from executives to pick-ax explorers. I’ve talked to everyday investors. I’ve done research into this market for years. What follows is a much broader, deeper and accurate portrayal of China’s gold market than what is usually seen in the media. At the least, a very different message emerges once you see it all tallied in one place. The Chinese view gold in the context of its role throughout history. Not as a vehicle for trading in and out of or even as an investment, but as the most secure asset they can hold to safeguard their country’s future monetary and financial standing. Those government and mining officials I mentioned were part of a mining tour several years ago, and I can tell you they dismiss (and even laugh at) the Western economist who arrogantly calls gold an outdated relic. They’re buying gold not just as a portfolio diversifier but in preparation for a new monetary order, the star of which will be a diluted and dying US dollar, as Mike has succinctly pointed out. As a result, they’re not looking at where gold will be in the next three months; they’re accumulating and holding for what could play out over the next several years and decades. It is this overarching long-term view that guides their decisions. What the Western journalist forgot to mention in their report is that China has allowed direct imports into the country – other than through Hong Kong – for a number of years now. So what used to be the proxy to measure Chinese demand is no longer accurate, and in fact can be very misleading. China now imports gold directly into Beijing, and also allows a number of jewelers, dealers, and at least 14 state banks to directly import gold. None of these figures show up in Hong Kong numbers. China rarely releases trade data on gold, so none of this data gets reported publicly and remains unknown. Why don’t they release the data? It seems clear that leaders don’t want import figures tracked so the rest of us don’t know how much they have. This move doesn’t imply demand is falling – just the opposite. And given the level of demand in the country, we know these amounts are not insignificant. The Shanghai Gold Exchange trades primarily in physical metal (the Comex, in contrast, trades mainly in gold derivatives). We can’t be certain, but “withdrawals” from the SGE can serve as a fair proxy for demand in the country. You can see in the chart below that it’s lower than the 2015 peak, yet look how much worldwide mine production it still eats up. And by the way, these withdrawals reduce trading volume in North America. Why? Because the Chinese don’t sell. So that metal won’t come back onto the market anytime soon, if ever. I saw one “Wall Streeter” express this very concern, which tells you how real this trend is. Annual mine output continues to increase. This while China is already the world’s largest gold producer, and does not export any meaningful amount. Does this all sound like weak gold demand? Do you get the impression that China’s interest in gold has subsided? Hardly. China’s insurance asset management industry is currently conducting an “in-depth study into the feasibility of investing in gold.” If it gets a thumbs-up, this industry currently has over $2.2 trillion in assets under management. What would be the impact on the price if some of this cash wants to enter the gold market? A mere 5% would equal $110 billion, an amount greater than the market cap of the 10 largest gold producers in the world combined. UBS reported that the number of billionaires China jumped a whopping 39% last year, totaling 373 billionaires worth a combined $1.12 trillion. It’s almost hard to believe, but two new billionaires were created per week in China last year. This from an economy that had only one billionaire at the beginning of the century – now nearly one in five billionaires in the world is in China. The number of “ultra-wealthy” has grown, too; those holding at least 10 million yuan (US$1.5 million) in investible assets is now 1.6 million people. I ask again: what if some of this massive slosh pile of currency wants to buy gold? One billionaire could spend just a tenth of his worth ($100 million) and buy 83,333 ounces of gold (at $1,200) – the only problem being that it would gobble up 73% of all the gold produced last year from every mine in the world. The Belt & Road Initiative – a worldwide infrastructure development project started by the Chinese – is one of the biggest undertakings of its kind in history, and in itself will have a dramatic impact on the gold market for decades and even centuries to come. It covers 68 countries and regions, most of Eurasia, and parts of Africa and Asia Pacific… it involves half the world’s population, and one-third of the global economy. There is little doubt that both gold mining and gold demand will increase as a direct result. The World Gold Council projects a major shift in global currencies is coming: “At some point in the future the renminbi may become a reserve currency, along with US dollars, euros and yen.” If the US dollar weakens to the point it has to play equal fiddle to other currencies, its value will necessarily have to fall – and the gold price will rise as a direct result. The decrease in dollar demand is a trend that’s already well underway internationally, and is likely to speed up. Many countries store gold as part of their official monetary reserves. It’s a backstop, an insurance policy against a collapse in the value of their currency or other economic calamities. Almost every report you’ll see about gold reserves measures them in relation to that country’s total reserves. The US, for example, has 73% of its total Reserves in gold, while China officially has just 1.4% of its Reserves in gold. But this calculation is misleading. The US has minimal foreign currency reserves, while China has $3.05 trillion. The denominators are vastly different. A more practical measure would be to compare a country’s gold reserves to its annual GDP. This would tell us how much gold would be available to support the economy in the event of a global currency crisis, something Chinese leaders appear to be preparing for. The following table shows the six largest holders of gold in terms of GDP (Eurozone countries are combined into one and include the ECB). Notice how much gold China would have to purchase to increase their gold-to-GDP ratio to just 2%. You can see that the Chinese government would have to buy 3,940 tonnes of gold –139 million ounces – to reach a 2% gold-to-GDP ratio. This would then put them on par with the top gold holders around the world. Though keep in mind their GDP is growing much faster than all those other countries including the US. Either way, this is probably a more realistic gauge of how they determine if they’re closing in on their reserve goals. 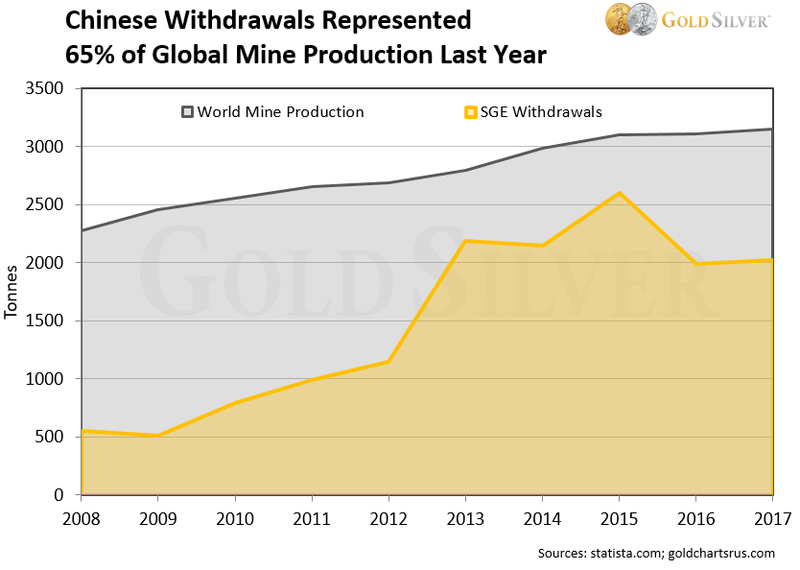 It seems clear that with China’s longstanding interest in gold, their economic growth, and their ongoing attempts to remove themselves from the US dollar system, that they will want more gold – probably a lot more gold – in their Reserves. Even mainstream economists have publicly stated that China’s current level of gold holdings is too low, given the size of its economy and the growing significance of its currency. So, is China stockpiling that gold now? Is that where some of the untracked bullion is going? It seems highly likely that China will announce a major increase in their gold reserves at some point in the near future. If so, it would serve as a major catalyst for the price. When might this happen? That’s total conjecture, but consider this: it’s possible they don’t make an announcement of this nature until they have all they want if we’re in or near a crisis. Which means the number would have to be big. This really could be a fireworks-type event for the gold industry. China is only one catalyst for the gold price. When you combine the numerous other forces that could ignite the gold market, I just don’t see how we don’t get a mid- to high-four-figure price at some point. Keep in mind, though, that gold is not just about the price. It’s about the role it will serve in your finances, investments, and everyday way of life during a major currency upheaval. And yes, further down the road, it’s also about how gold will become dramatically overvalued compared to other investment classes. If you see the future as China sees it, you need to have a meaningful exposure to physical gold. Anything that represents a small portion of your net worth will not provide the kind of asset and lifestyle protection you’ll need. I don’t know about you, but I continue to buy gold. And I’m not worried about the price, because China’s got my back.